Braid Orientation: Cousin Trestec’s experience and expertise in rope manufacture guided the development of the critical braiding angle to maximise grip and minimise slippage. Fibre Assembly: Extensive knowledge of fibres combined with laboratory and field testing has resulted in an optimum fibre balance and density for unmatched strength. Treatment: A specialised surface treatment plays a critical role in extending the product life, boosting grip and reducing abrasion in stress areas. The patented textile sleeve element is locked in place between a titanium ring and the base unit. 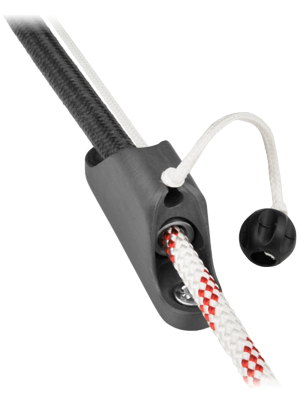 The unique conical geometry allows easy insertion of the rope, and ensures that the sleeve is perfectly integrated with the alloy base unit in supporting the applied load. Pulling on the Dyneema® lanyard retracts the sleeve, relaxing the grip on the rope and allowing it to run freely in either direction. The lanyard can be fixed in the V-notch of the base unit to hold the Constrictor® in the open position. Releasing the lanyard allows the sleeve to be drawn to its extended position by a shock cord, constricting the rope in a firm, secure grip. CT306P001 Constrictor 6 (1/4”) 45 4 1/2" 588 23 5/32” 70 2 3/4" 90 3 1/2" 8 5/16"
CT308P001 Constrictor 8 (5/16”) 45 4 1/2" 638 25 1/8” 70 2 3/4" 90 3 1/2" 8 5/16"
CT310P001 Constrictor 10 (3/8”) 45 4 1/2" 638 25 1/8” 70 2 3/4" 90 3 1/2" 8 5/16"
CT312P001 Constrictor 12 (1/2”) 58 5" 787 31” 70 2 3/4" 90 3 1/2" 12 1/2"
CT314P001 Constrictor 14 (9/16”) 58 5" 787 31” 70 2 3/4" 90 3 1/2" 12 1/2"
You will already find the Constrictor® solution in use on the top Maxi, Mini, Multi, IMOCA and AC72 teams. COUSIN Trestec have developed a trouble-free and ergonomic product that will please anyone looking for the New Generation in rope holding technology. The manufacturer of the Constrictor® COUSIN Trestec is renowned for technical and professional competence in lines, ropes and fibre cables. COUSIN Trestec brings together the strength and knowledge of a industrial group for the service of its customers. The secret of their success? Unrivalled know-how, coupled with a wide and diversified range of high spec products supplied and supported through a worldwide network of agents and distributors. Constrictor® gives you the opportunity to completely redefine your deck plan. It offers high performance rope holding with an unrivalled level of integrated and aesthetically pleasing solutions – free from the clutter, bulk and obstruction of conventional rope clutches. Why have your clutches visible when they can be hidden under a low profile hood or partition! Custom Constrictor® solutions are available with holding power up to the break load of the rope, and ‘insert’ designs are possible for direct integration into hull or spars via lamination or other methods. Contact us to discuss your needs.